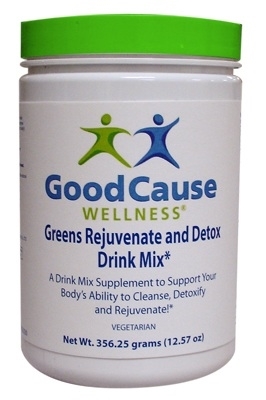 Why Should I Use Greens Rejuvenate and Detox Drink Mix? Good Cause Wellness Rejuvenate and Detox Drink Mix provides a wide-range of phytonutrients to support vital activity like detoxification, antioxidant, digestive and immune system functions. Like all Good Cause Wellness products, our Greens Rejuvenate Drink Mix is easy to use and tastes great. Simply add a scoop (included in the canister) to a glass of juice or water. A single serving contains only 50 calories! What are the Key Ingredients in Greens Rejuvenate Drink Mix? Our Greens Rejuvenate and Detox Drink Mix combines nutrient-rich vegetables, fruits and herbs with enzymes and probiotic cultures. Other nutritious ingredients include grape seed extract, non-dairy probiotic culture, bee pollen powder, bilberry extract and green tea extract. To read the label for this product and view a complete list of ingredients, please click here. What Are the Benefits of Greens Rejuvenate Drink Mix? There are four main benefits to our Greens Rejuvenate and Detox Drink Mix. Spirulina supports healthy function of the liver to aid in detoxification. Chlorella supports cell reproduction and restorative processes that promote healthy organs and tissues. Chlorella also helps the body break down unwanted materials like heavy metals. It also supports proper digestion by promotion growth of beneficial bacteria. Spirulina and chlorella are both sources of blue-green algae, a potent antioxidant. FOS (fructooligosaccharides) is a soluble fiber and pre-biotic to support the growth of beneficial bacteria. FOS also aids in the elimination of unwanted substances and supports GI tract health. Immune system functions are supported by the oat beta-glucans, with strong immune system support properties. They support the activity of macrophages that clear away cellular debris and other unwanted materials. What’s Not in Greens Rejuvenate and Detox Drink Mix? Sometimes that’s just important a question as what’s in a product. Our Greens Rejuvenate Drink Mix is vegetarian and free of gluten, rice and yeast. How Do I Use Greens Rejuvenate Drink Mix? Simply use the included scoop to add to juice or water once daily. Each canister contains about 30 servings. ** Percent Daily Value based on 2,000 calorie diet. Information on this site is for educational purposes only. Statements about product efficacy have not been evaluated by the Food & Drug Administration. These products are not intended to diagnose, treat, cure, or prevent any disease. In matters related to your health, contact a qualified health care practitioner. If you are pregnant or nursing, you should consult a health care practitioner before using this or any nutritional product.